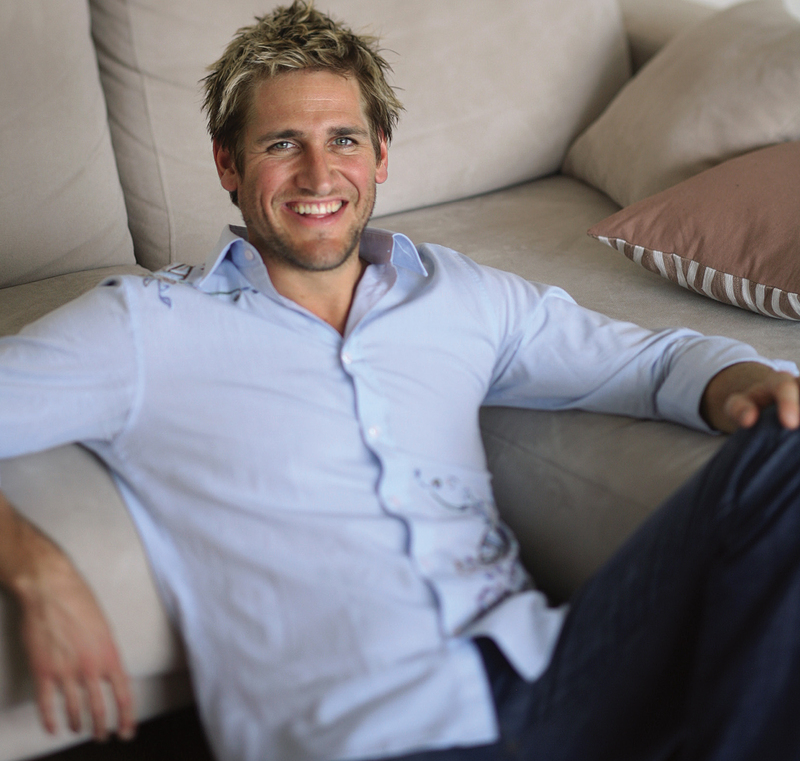 Curtis Stone has a straightforward kitchen code: take pleasure in simple foods and enjoy them with close friends. And his latest cookbook, Relaxed Cooking with Curtis Stone: Recipes to Put You in My Favorite Mood, emphasizes that message. The enigmatic, blue-eyed star of TLC’s Take Home Chef cooking show, Stone is known for sweeping unsuspecting shoppers off their feet and whisking them home to prepare impromptu feasts. We may not all be so lucky, but at least we can channel his recipes in his latest book, fittingly accompanied by mouth-watering photography of food (and chef). Originally from Melbourne, Stone worked in restaurants throughout Europe before landing in London to head up Quo Vadis, Marco Pierre White’s flagship. Stone is now based in Los Angeles, where he wakes at the crack of dawn to go surfing most mornings. The California shores deliver not just killer waves but culinary inspiration as well. “My cooking is influenced by all the places I’ve travelled,” says Stone, “and there’s nothing like a breakfast burrito right after an early morning surf. In Oz, we used to just have a meat pie, but this is so much better.” With this in mind, Stone concocted a gourmet interpretation of the high-protein breakfast for Relaxed Cooking: a spicy breakfast burrito teeming with cilantro, eggs, jalapenos, and sausage. Even though he describes the writing process as “the male equivalent of childbirth”, it’s quite clear that Stone is proud of the project. Each recipe incorporates the freshest of ingredients—think vine-ripened tomatoes, organic rhubarb, and fresh burrata cheese. Coinciding with the Canadian launch of the cookbook is another treat from the Stone repertoire: his first full line of kitchen cookware designed to save time in the kitchen. The streamlined little Bump and Grind pestle and mortar is handy, and the eco-friendly bamboo Workbench Cutting Board comes complete with built-in stainless-steel measurement bowls and a disposal drawer. From plum crumble to paella, the recipes in Stone’s cookbook are arranged in chapters with playful titles like “Brunch that will blow their minds” and “Something to eat on the sofa”. And for dessert, take the chef’s recommendation on the lemon curd tarts (they’re his favourite). Yes, he’s a laid-back bloke, but cook up a few of these dishes to see how his creativity has earned Stone his well-deserved superstar status.